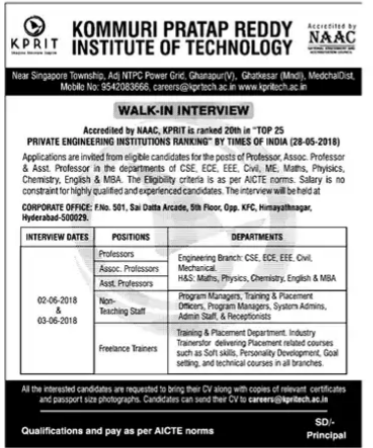 Kommuri Pratap Reddy Institute of Technology, Medchal has advertised in the DECCAN CHRONICLE newspaper for recruitment of Professor,, Associate, Assistant Professor, Non Teaching Faculty jobs vacancies. 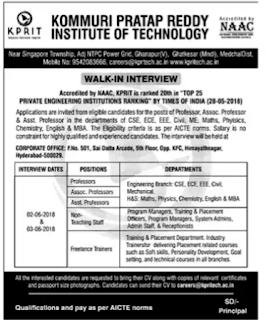 Interested and eligible job aspirants are requested to attend 02.06.2018,03.06.2018. Check out further more details below. About College:Everyone can imagine but not everyone can implement. Here is place for your imagined idea to be innovated and inspire, KOMMURI PRATAP REDDY INSTITUTE OF TECHNOLOGY. KPRIT is established to power your imagination with innovation and inspiration. And that is through providing quality technical education on par with international standards.